World No.1 and number one seed Mohamed Elshorbagy began his bid to win a maiden World Championship crown with a comfortable victory over Mexican challenger Alfredo Avila during the opening day of action at the 2015 Men’s World Championship in Bellevue, Washington. 2012 and 2014 runner-up Elshorbagy was in impressive form as he saw off a doggedly determined Avila 3-0 after just 31 minutes to send an early message out to his main title-rivals during an opening day of first round action that saw the seeds in control of proceedings throughout. “I’ve only got this one [the World Championship] left to win,” said Elshorbagy, who held match-ball to win the title twelve months ago in Doha. “I’m only 24-years-old so it’s not too bad. If I don’t get it this year I still have so many years to come but of course I really want to win this one. “It’s the first time ever that the World Championship is here in the United States. It’s great, the tournament has been set up perfectly for the players and I’m really looking forward to playing well here this week. 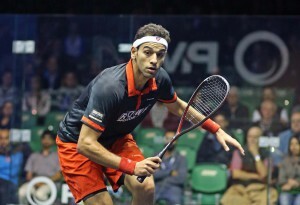 One of Elshorbagy’s main challengers from the title, French World No.3 Gregory Gaultier, produced an equally impressive first round performance against compatriot Lucas Serme to get his campaign off to a positive start as he aims to end his heartbreak at the sport’s most prestigious tournament – having fallen at the final hurdle on four separate occasions. With the all-French battle coming in the wake of the recent atrocities that occurred in Paris Gaultier was keen to reference the impact the events had on his preparations and the extra motivation it has given him. “I was really thinking that I needed to give all my heart and produce a good performance for my country today,” said Gaultier. Elsewhere Todd Harrity will carry the hopes of nation on his shoulders after he overcame Scotland’s Alan Clyne to become the only US player to progress beyond the first round of the tournament. Harrity scraped through 3-2 after 63-minutes to book his second round berth, improving on the performances of top ranked US player Christopher Gordon, who bowed out of the competition during the final round of qualification, and the most successful US player of recent times, Julian Illingworth, who fell to a straight-games defeat to Miguel Angel Rodriguez of Colombia in round one.